uKeg's are miniaturized kegs available in half-gallon and one gallon sizes. Unlike traditional half gallon growlers, they are made of double-walled vacuum insulated stainless steel. 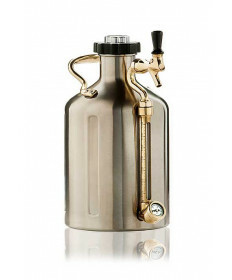 uKeg's pressurized growler has a CO2 regulator cap keeps your beer pressurized, just like in a full size keg. So when transporting your brew, you can be sure that it will stay cold and carbonated for optimal drinking conditions. The tap handle on Growler Werks uKegs are also customizable. Growler Werks was also sure to include an attached pressure gauge, which tells you the exact dispensing pressure of your beverage. No worrying about your beer being over- or under-carbonated while on the go. Don't let your homebrew or craft beer go flat in a standard growler! Get the Grower Werks Ukeg Pressurized Growler today!